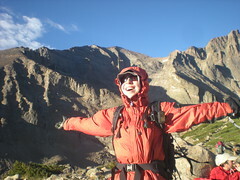 CMC Group met at the Longs Peak Ranger Station. Leader crossed names off a list, and we waited for one gal who was about 10 minutes late. When she arrived, we took off hiking. Not knowing about the team capabilities (except mine & Linda’s) prior to our hike made me a little nervous. I had to trust the leader Steve had a rough idea. This trip was completely the opposite of the prior CMC trip I had attended, which was executed with a militaristic degree of efficiency and planning. Steve’s leadership is a laid back and all-inclusive style. “Oh, don’t mind him, he’s an engineer…I’ve been out with him before and he’s always like this.” (referring to above quote!). 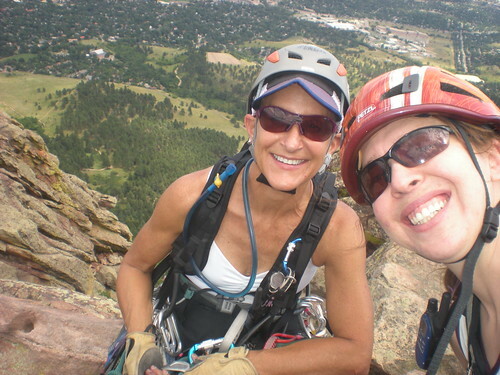 Lauren & I climbed the East Face of the Third Flatiron with her 70 meter rope. 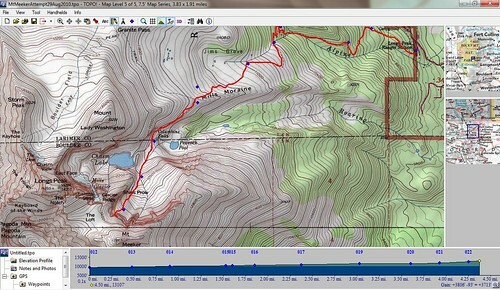 We did the route in 4 very long pitches, with way more gear than we should have taken. Extra weight is good for training, right? We had enough stuff for a 120 meter rope (if they make such a thing!). Lunch at South Side Walnut Cafe where I had the artichoke heart & swiss omelette & french toast. Totally YUMMY!!! 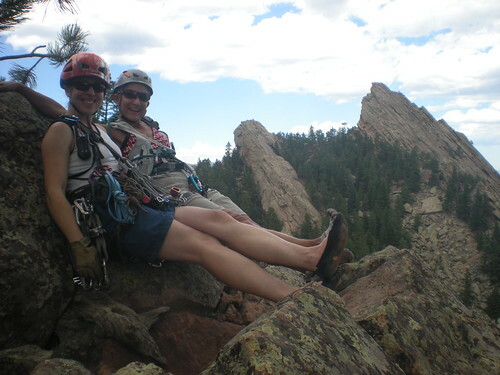 I joined Kat for an all day practicum with the Colorado Mountain Club. This final day was the most insightful and useful class! Dennis had also signed up for the class (3 lectures and the practicum), but he bugged out on the last day, in favor of playing Ultimate. Day time temps were in the mid 90s, which was scorching on the rock! I’m glad we had a 70 meter rope, but it still wasn’t quite long enough to combine pitches 3 & 4 without simul-climbing. In future, I would do it with a 60 meter rope, and just know that I’d have to simul-climb. Wearing the swami belt was uncomfortable and painful. It made me feel grateful for the generations before; it is their pain & suffering which has promoted the shift in design and innovation for safer, lighter, and stronger equipment! Lauren & I went to Cimarron Canyon State Park under the auspices of checking out some climbing areas. In her Taos Rock Climbing guidebook, it lists a couple of crags in the park as having some moderate climbs. We hiked up to the Maverick area, and scoped it out. I AM NOT POSTING ANY OF THE PICTURES I TOOK BECAUSE THIS WALL IS CLOSED. In fact the entire SP has been closed to climbing. From reading the following forum, posted on Mountain Project, I did not get any happy vibes that this issue would resolve anytime soon. So, saddly, we didn’t climb there. Even though, it looks like tons of fun! You are currently browsing the climbergirl blog blog archives for August, 2010.